and become a full part of that creation"
The medical information received via Cayce's clairaudient readings set in motion a new medical paradigm in the electrified portions of the Western hemisphere. Yet personally, Cayce was often frustrated with the lack of coherent results from his many schemes and ideas. In fact he was somewhat impatient and temperamental when not in trance. He embraced the fundamentalist Presbyterian faith of his folk, but came to despair of the legitimacy of the cheerfully oversimplified doctrine he had received. During his clairaudient healing career he suffered much conflict (Shani-Rahu) between his received, folk Christian doctrine vs. the wildly adventurous and taboo-breaking philosophy emitting from Rahu. The clairaudiently channeled spiritual worldview that he produced seemed to contradict, indeed insult, the humble biblical orthodoxy with which he was raised, which he trusted, and which showed the only path he knew toward inner peace. Lucifer, taught to Cayce as the devil, emerged as a being of Light (according to Lucis, named Light). The greater reality which Cayce was chosen to expose to the common folk indeed did seem anti-religious, and Cayce wanted to recover the security of his childhood as a humble, orthodox believer. Doctrinally he faced a very complex situation. Cayce had much polarizing catalysis to maintain the "fundamentalist" scriptural interpretations of his childhood due to a very complex bhava-2 * knowledge lineage treasuries * that contains rulers of six bhava plus Rahu. Dad Surya-3 was a jack-of-all trades and latterly an insurance salesman (3) while Cayce's main profession was photographer (Surya-light-3). Dad was a significant energy source for Edgar. Mr. Leslie Caycer lived long and died when Edgar Cayce was 60. He betrayed Edgar for money, but was forgiven by his son. 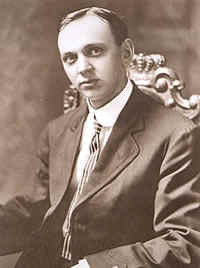 Edgar Cayce died age 67. Surya rules Edgar's Uttara-azadha nakshatra and Surya rules-8 for the Makara lagna. No matter Surya's rashi or bhava, for the Uttara-azadha native Surya plays a definitive role usually involving occult matters and often pouring light into what had been a dark, lightless place. Cayce channeled the bright light of truth for many years during exceptionally dark times of the Great Depression + the terrible violence of World-War-2. Hailing from the barely literate (and thus highly intuitive) Appalachian hill farming district in the latter 1800's, Edgar Cayce was familiar with an array of home cures. His maternal grandfather was a gifted dowser. Via the intuitive readings, and on the basis of his farm-life understanding of remedies (Chandra-4) Cayce was instrumental in the cultural process of reinterpreting the rural American farm tradition of plant-based remedies and food cures. In addition to subsistence farming in 19th century Kentucky, his father sold insurance and his mother taught community Sunday-School . Chandra-4 = mother school teacher. Chandra-4 home-cures; Karakamsha Mesha-4 home-cures, folk traditions, folk religion. Makara swamsha sets the time of marriage Chandra-Chandra bhukti. Kuja energy. Clairaudient healer Edgar Cayce opened up a vast new world of energy medicine in the 1920's. Cayce helped thousands find relief from suffering, including relief from terminal disease and disabling injury. Cayce was the subject of much argument by conventional medical-men regarding the viability of his channeled cures. Typical of the profession, the doctors were prone to reject the cures not due to a lack of efficacy (the cures worked) but because the mechanism could not be explained. notoriously struggled throughout his life with the conflict between two doctrines. In waking life, he was fully devoted to a culturally embedded fundamentalist protestant Christian doctrine. Yet in trance, he produced voluminous teachings on higher cosmology and vast historical knowledge which sometimes contradicted the narrower view of his waking catechism. Budha rules bhava-9 paradigms of belief, sacred teachings, doctrine. Budha-yuti-Rahu opportunistic use of knowledge base (2) AND Budha-yuti-Shani resistance to change in the knowledge base (2). 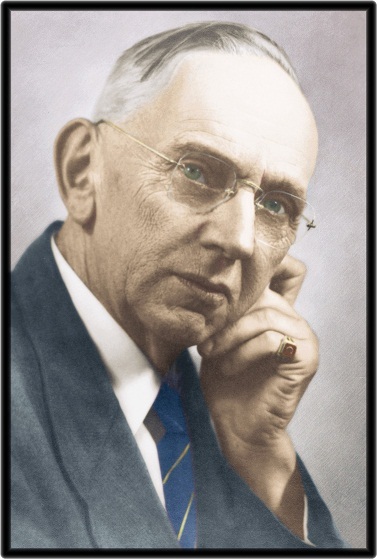 Edgar Cayce was a Sunday-School teacher, a father, a transmitter of knowledge from mystical sources. Like nearly all of the Scots-Irish American settlers of Appalachia, his folk were Presbyterian Christian tobacco farmers. Guru rules Arudha lagna = bhava-3 announcements, reports. Via clairaudient instruction from Source, Cayce's "readings " (announcements from Source) transformed the healing properties of common foods and minerals (Vrischika) into the exciting volume of knowledge called new-age medicine. The healings achieved via the clairaudiently received instructions were documented as effective in most cases where the instructions were followed correctly. Particularly notable cures were recorded in hopeless cases where the patients had been abandoned by their doctors. Yet Cayce's techniques were disparaged by the conventional medical establishment. Edgar Cayce and his beloved Gertrude Evans, 1897 (Edgar age 20). Their lives would have volatility, but also steadfastness. Edgar Cayce ("kay-see") was a brilliant psychic reading and healer born in 1877 in a rural farm community to uneducated parents. He received a minimal formal education (8th grade) yet in a state of hypnosis he was able to communicate a worldview of tremendous insight and learning. During his 67-yr lifetime, Cayce delivered approximately 20,000 readings, of which about 14,000 have been preserved. He was a lifetime member of the Disciples of Christ community of Christian believers, and he read the Christian Bible once every year as a personal spiritual practice. Yet, under hypnosis, the readings gave no preference to Christian dogma and indeed recommended to those who requested readings that they look into parallel lives contextualized by many different world religions and a variety of belief systems. The central constant in all of Cayce's readings is an insistence that all beings are seeking unification with the Divine, and that service - both his own and his beneficiaries - is the only viable path toward the realization of that union. Cayce tried a number of business ventures in his life, believing like most men of his generation that wealth and public respect were the greatest service he could and should offer to his own family. However, as each of these ventures systematically failed and the attempts wore him out, Cayce eventually surrendered to the ethic of providing most of his readings for the benefit of healing the sick. As a result, while Cayce's metaphysical and speculative-historical views are completely fascinating to many in later generations, the majority of Cayce's readings are medical. The cures he suggested while in trance are without exception simple on a chemical level yet most also involve some spiritual instruction regarding the elimination of toxic emotions.